Ok, so before we talk about this week's recipe, let me give you a little bit of a back story. For years and years, I've had a tradition with my niece, Terri, on the night before Thanksgiving. At first, it started out as "Uncle Joey, will you please help me make stuffing for my in-laws?" It has now turned into "how about you make the stuffing, and I'll have a glass of wine?" Either way, we always get together, and it's always a fun night. So, last year, we were discussing our cooking agenda for the night, and at the last minute, Terri decided that she wanted to make a dessert. I said, "ok, what ingredients do you have?" She mentioned a few things and it became very apparent that we'd be baking an apple pie. Perfect. As I was tossing the sliced apples with cinnamon, nutmeg, and sugar, she said "let's throw in a little almond extract!" Now, that's not usually one of my go-to add-ins for an apple pie, but she declared how much she loves anything with almond extract in it, and I figured, "hey, it's your pie, you can throw in anything you want!" So I added a few drops. It was delicious! Honestly, we couldn't stop stealing the apples out of the bowl while I was rolling out the crusts. And then I thought, "wait, how did I never know that you like almond this much?" I would search for an almondy something for you!" And now you're up to date with my inspiration for finding this recipe. To be quite honest, I found several almondy type recipes, and this is just the first (from a site called Genius Kitchen). Something tells me I'm gonna be making ALL of them for Terri until we find the favorite one. I guess I have several months of testing before we have our next Thanksgiving Eve cooking event. In the meantime, these almond squares are the perfect little sweet treat to bring to a brunch or a BBQ or a potluck. They're so tasty and they're super simple too!! And yes, of course, I'll be sure to let you know if we ever settle on a favorite! Beat together the eggs and sugar until lemon-colored. Add the butter, flour, and almond extract; mix well. Spread the batter in an even layer on a buttered 13x9-inch baking pan. Sprinkle the top of the batter with sliced almonds. Bake at 325° for 30 to 35 minutes, or until a toothpick inserted in the center comes out clean. Remove pan from the oven and dust the top with a light sprinkling of confectioner's sugar. Cool completely before cutting into squares. Just as with any type of nuts, you definitely want to toast them before you use them. Have you ever had grits? In case you're not familiar, grits is a sort of porridge made from boiling coarse corn meal. It's kind of like polenta, and it originated in Southern US. It's very often served as a savory breakfast food, alongside eggs and bacon or ham. In addition to being a breakfast staple in the South, it's also classically paired with shrimp and served for dinner. 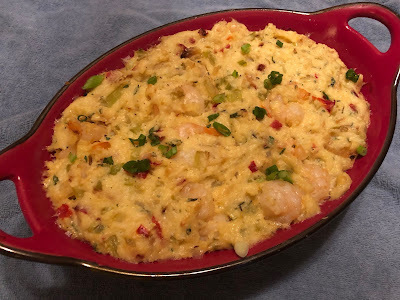 So when I was looking for a brunchy sort of dish that could also be served as a dinner, I figured well, how about a shrimp and grits casserole? 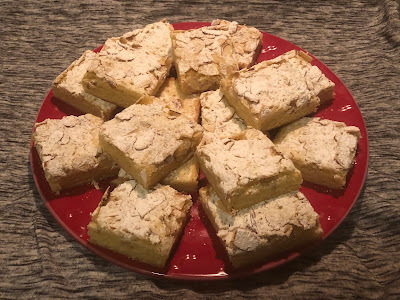 A quick google search and I discovered this recipe from Betty Crocker, and it was exactly was I was looking for. Side note..... I did see many other recipes that include lots of spicy cajun and creole seasonings and smoked andouille sausage, etc, but that wasn't what I was going for. I mean, I'm sure they're great and all, but I wanted to be able to taste the shrimp instead of covering it up with all those spicy bold flavors. So there you have it. It's really easy to put together and it doesn't take very long at all. And since the shrimp cooks right in the casserole, the flavor REALLY comes through. If you're looking for something different for your next brunch, or even just for a simple seafood dinner, give this one a try. If you're not sure if you'd like grits, I think this one will definitely convince you!! Heat oven to 375°F. Spray 11x7-inch (2-quart) baking dish with cooking spray. In a large skillet, heat oil over medium-high heat. Cook chopped vegetables in oil 5 minutes, stirring occasionally, until tender. In a large heavy saucepan, heat milk and broth to boiling. Gradually add grits and salt, stirring constantly with whisk. Cook 5 minutes, stirring constantly, until thickened. Remove from heat. Stir in pepper and cheese. Stir in vegetable mixture, shrimp, eggs, parsley and thyme. Spoon mixture into baking dish. Bake uncovered 25 minutes or until set. For me, the key is the fresh thyme. It adds the most perfect savory note to the shrimp. Want to add other seafood? Go for it! I think adding lumps of crab meat would be FABULOUS. Btw, if you can't find the Boursin cheese, just use any favorite herb flavored whipped cream cheese spread. It really adds tons of flavor and creaminess! Speaking of creaminess, I think next time I may add a little extra milk or cream. The grits really absorbed a lot of the liquid and that little extra bit of cream would be just the thing! Right off the bat, I should probably say that I don't often go the spicy route with my cooking. I mean, yes, of course, I like lots of spices, but just not very much HEAT. Very often, I'll taste something and think "that's too hot." And someone else will say "I can't even taste any heat!" Hmm... Maybe I'm a Supertaster? (Yes, that's a real thing) Or maybe I just don't like really hot food. But every so often.... actually not very often at all.... once in a blue moon... I'll try something with a little extra heat. And that would be today! I was thinking of doing a shrimp and pasta something. Awesome. Love it. My first thought was to do something with lots of butter and garlic, but then I decided that it would be too similar to Shrimp Maureen, which is already a perfect dish and needs no tweaking. So I opted for a tomato sauce, still with lots of garlic, and maybe a few pinches of crushed red pepper flakes, which is usually my go-to when it comes to adding heat. I kept it pretty simple with just a few basic ingredients, and then I cooked the shrimp right in the sauce. It was SO GOOD! I was so pleased with it, I even pushed the heat a little further than I normally would. Absolutely delicious! The shrimp flavors the tomato sauce, and it's zesty and garlicky and was just exactly what I was craving. It was ready in less than 30 minutes too! So you could easily throw this together for a Friday night quiet dinner after a long day of work, or save it for the next time you want to impress someone. It's that easy and elegant! So if you're all about hot and spicy, try adding this to your repertoire. It's really tasty and I know you love it! Enjoy! In a large pan or sauce pot, melt butter over medium heat. Saute onions until they begin to soften. Add garlic and continue to gently saute, making sure not to brown them too much. Add crushed tomatoes, tomato sauce, basil, salt, pepper flakes, and grated cheese. Bring to a boil, then reduce heat to low. Let it simmer for about 10 minutes. Meanwhile, bring a large pot of salted water to a boil. Add linguini and cook according to package direction to desired doneness. Add the cleaned shrimp to the sauce. Simmer for another 5-10 minutes or until shrimp are cooked through. Toss the linguini with the sauce. Top with more grated cheese and chopped fresh parsley. One of the best things about this dish is that you can tailor it to your own tastes. Make it as spicy as you like! I just did a few pinches of red pepper flakes, but if you like it really spicy, add as much as you want! Add more butter and garlic. Add more onions! Are you making a big batch? Double everything! I also added more than just a pound of shrimp. More is more!! Whenever you boil pasta, be sure to add enough salt to the water. You want it to be as salty as the ocean! 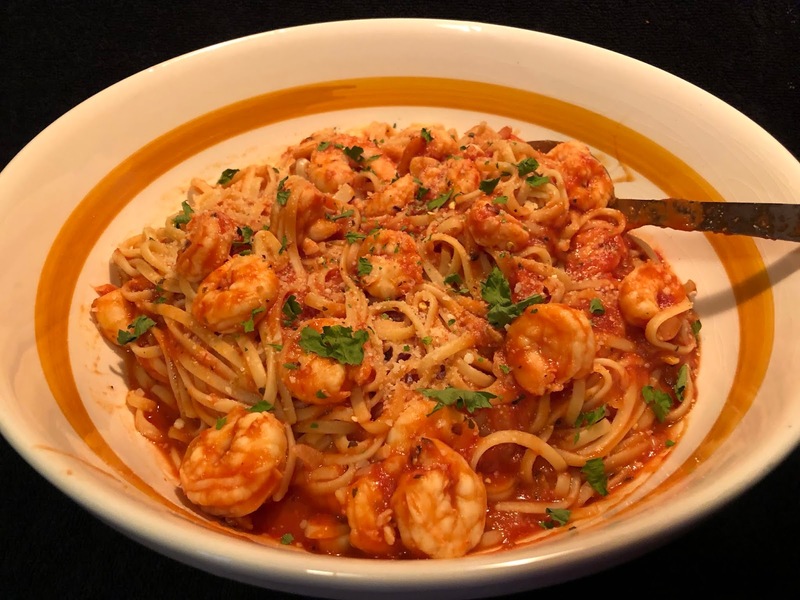 As I was looking for some delectable seafood ideas, I happened upon this recipe from a website called Favorite Family Recipes. It looked easy and flavorful, so I figured I'd give it a try. O.M.G., can I just tell you how fabulous it is? It's rich without being too heavy, it's easy to throw together, and it's ready in no time. Even the cooking novice can make this with great success! 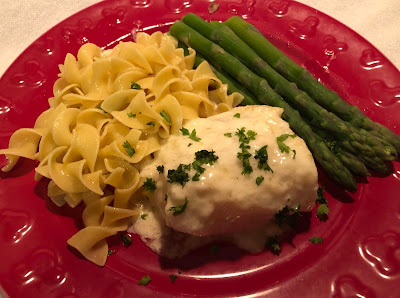 The sauce is basically an Alfredo sauce, so you know you can pour it over anything... but who would have ever thought of baking fish fillets in it? It's sheer genius! I wish I had thought of it! When I was growing up, basically the only way I wanted to eat fresh fish was breaded and fried. I think this is now my go-to recipe. Oh, and if you're someone who doesn't eat fish because it's too "fishy", fear not! This recipe is the one for you to try! Melt butter in a medium sized sauce pan over medium heat. Slowly add the cornstarch and stir for about 1 minute. While whisking constantly, slowly add whipping cream and milk until well combined. Stir in Parmesan cheese. Reduce heat to low and whisk occasionally for about 10 minutes until sauce becomes rich and creamy. Season with salt and pepper, to taste. Set aside. Spray a 9x13 baking dish with cooking spray and place cod fillets in the dish. Sprinkle with salt. Combine melted butter and garlic and brush over fillets, reserving any leftover butter mixture. Sprinkle seasoned breadcrumbs over fillets and pour remaining butter mixture over the top. Pour cream sauce in the spaces between the cod fillets so it fills up the baking dish and just the tops of the fillets are visible. Bake for 25-30 minutes or until the cream sauce starts bubbling. When the sauce starts bubbling up, place the dish under the broiler for about 3-5 minutes or until the fillets start to turn golden brown. Serve with potatoes, buttered noodles, or rice and any steamed veggies. The sauce recipe makes quite a lot, definitely more than you need for 4-6 fillets. You could either cut the recipe in half, or pour the delicious sauce over your potatoes, noodles, or steamed veggies. OK, I know there are already one or two of you out there who are crinkling your noses at the thought of a tuna Sloppy Joe. And to that I say Don't knock it 'til you've tried it! Seriously, though, why???? I literally asked 5 people if the idea of a tuna Sloppy Joe sounded good or gross. ALL FIVE said things like "ew" or "yuck" or my favorite: "you're gonna need to convince me." Ok, this is me convincing you! 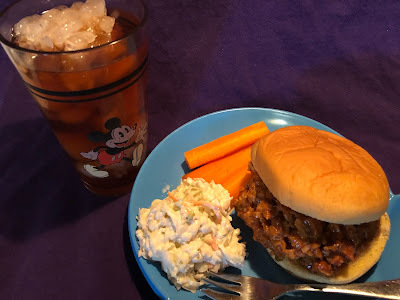 For those of you who may not know, a Sloppy Joe is a sandwich, usually served on a bun, usually made of ground meat in a slightly sweet tomato based sauce. So why doesn't anyone want to swap out the beef for some tuna? Is it the tomato sauce? Well, no, because it's very common to add tuna to a tomato sauce for pasta. So it beats me why my panel of judges gave this idea an immediate thumbs down. I thought it sounded pretty great, to be quite honest! In fact, I found several different recipes for it, so CLEARLY I'm not the only one! My only dilemma was which recipe to try! It came down to two ideas: Make the sauce from scratch, or just open a can Sloppy Joe sauce. Well, of course I tried BOTH, because I needed to see which one was better!! Usually, with beef Sloppy Joes, I would just open up a can of Manwich sauce and call it a day, but I wanted to try the scratch recipe to see if it was as good or even better. The recipe below is from Clover Leaf Seafood, which is based in Ontario Canada. It has several ingredients in it, all very easy. You mince a few aromatics, simmer the sauce, add tuna, and there it is. And guess what? It was DELISH! It's everything you want in a Sloppy Joe, only without the meat, and it's a great alternative to your usual Friday night fish sandwich. And then I tried the Manwich sauce. Very similar, but slightly different, and also quite delicious! So as far as which one is better, I think it's a solid TIE for the win. I guess it depends what you have in your cupboard. Do you have a can of Manwich? Easy and fast. Do you have the other ingredients? Go for the scratch recipe. Either way, you'll have a yummy saucy sammy that is everything a Sloppy Joe should be. You should give it a try!! Even with the Manwich sauce, I still sauteed some onions and peppers and then added them to the canned sauce with the tuna. It just makes it better! The original recipe called for one soup can of water, I suppose that is to give it time to simmer while reducing the sauce. I omitted the water just to save time! Very often, especially around St. Patrick's Day, people serve corned beef for dinner with the classic side dishes of cabbage and potatoes. But what if cabbage isn't very high on your list of favorites? Do you serve just plain corned beef and potatoes? No! You make this casserole instead! 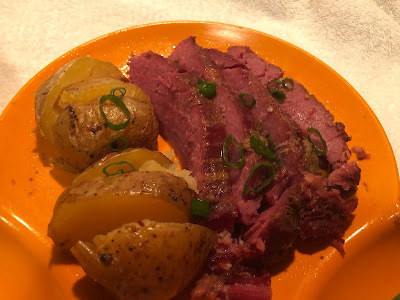 Or what if you have a bunch of corned beef and potatoes leftover from your boiled corned beef dinner? What do you do? Well, this casserole is the perfect round two! For me, the thing that makes this dish is the fresh dill and the rye bread crumbs. 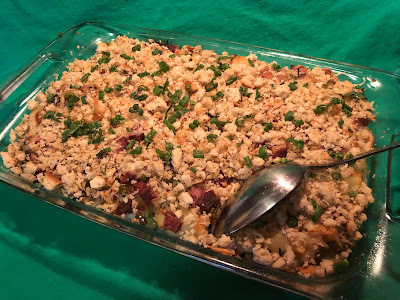 They both bring a fabulous caraway flavor that goes famously with corned beef. The other thing that really makes it is that little hit of mustard. It goes so well with the Swiss cheese and adds a brightness to the whole party. I'm not even kidding when I say that this is one of my favorite things that I've made in quite a long time! Seriously, this has such a fabulously different flavor, I think you should give it a try! In a large skillet, melt butter. Add onions and peppers and place over medium heat. Saute until they soften up a bit. Then add garlic, corned beef, and mustard. Stir well. Sprinkle flour over all. Stir until everything is well coated with flour, about 2 minutes. Add milk and stir well. Add chopped herbs, salt and pepper. Stir well, and simmer until thickened. Adjust seasoning if needed. While the sauce is thickening, place half of the boiled potato slices in one layer on the bottom of a 9x13 or similar casserole dish. Top with half of corned beef mixture. Sprinkle with half of the Swiss, then half of the Monterey Jack. Repeat all layers. Bake until bubbly, about 30 minutes. Sprinkle the top with the buttered rye bread crumbs. Place back in oven until crumbs are lightly brown. Remove from oven and let stand for a good 10 minutes. Garnish with chopped scallions, if desired. To boil potatoes, place them in a pot of cold water over high heat. Bring them to a boil. Since potatoes are different sizes, they will all finish cooking at different times. Test each potato with a fork (not a paring knife) removing each potato from the pot as it becomes tender, starting with the smaller potatoes and ending with the largest potatoes. To make rye bread crumbs, place 2 or 3 slices of rye bread in a food processor and pulse until they become crumbs. Add some melted butter, then pulse a few more times. Do you like corned beef as much as I do? I have to say it's one of the most under-used meats, but it's so delicious! Why do we wait until St Patrick's Day to make it? (I say this about turkey on Thanksgiving too, but I digress...) Frankly, I've never had a corned beef dish that I didn't love. Whether we're talking about a Corned Beef Special (which is a sandwich of sliced corned beef, Swiss cheese, Russian dressing, and coleslaw on rye bread), or your basic Reuben Sandwich (which is basically a hot version of the same thing, only with sauerkraut instead of cole slaw), I love all of it. One of the BEST ways (and some would argue the ONLY way) to cook a corned beef brisket is in the slow cooker. You just let it cook low and slow, and you wind up with a brisket that is fall-apart tender and perfectly delicious. So, let's talk about recipes and prep, shall we? It's REALLY simple and anyone can do this. And I mean ANYONE! To be quite honest, I never even follow an actual recipe. Basically, you can go with the bare minimum, or go all out for an entire corned beef dinner in one pot. It's flavorful, hearty, and it's comfort food at its best. If you've never tried it, then I'd say now is the time! Here are a few of the ways that I've tried. You just place your 3 or 4 pound brisket in the slow cooker, (fat side on top), sprinkle it with the packet of pickling spice that usually comes with it, (you could even add a little more, if you like), then add about a cup or two of water, and set it on low for 8 or 9 hours. You could slice it against the grain, or even pull it apart with two forks for sandwiches. Simple right? Start the same way as Option A with your 3-4 pound brisket. Place it in your slow cooker, (fat side up), then add whatever aromatics you like. A few cloves of garlic, a sliced onion, a few carrots, a couple bay leaves, some fresh dill. And instead of adding just water, add some beef broth. Slow cook for 8 or 9 hours. Serve with potatoes mashed with lots of butter and cream. Start the same way as Option B, with your 3-4 pound brisket and all of your aromatics. After about 4 hours of cooking time, add whole or halved potatoes and/or other root vegetables. Then two hours later, add some sliced or wedged green cabbage. Slice your brisket against the grain, and serve your vegetables on the side. Instead of adding water or broth, try adding an entire bottle of stout and a couple tbs of brown sugar. I've even substituted apple juice instead of the other cooking liquids and added sliced apples to the party. Then cook it the same way. Low and slow for about 8 or 9 hours. To make gravy, after it is finished cooking, remove everything from the slow cooker, leaving just the liquid. Whisk in a slurry of flour and cold water to the cooking liquid. Set it to high, and give it a good stir so that the liquid thickens up a little. You can speed up that process by adding some of the strained liquid to a small pot, stir in your slurry of flour and cold water, and then cook it on the stove top over medium heat until it thickens. Be sure to taste the gravy and adjust the seasonings if needed. You probably won't need to add any salt, but maybe a little cracked black pepper.